Yeah, so, despite being named "Madison Beer Review" and our promise to review more beers, we've been extremely negligent in actually reviewing beers. Part of the reason is the paucity of the late-spring seasonals. Most of the breweries around here run their lighter, summery beers as year-round offerings, so there have been few "big seasonal releases" like we get with the Oktoberfests, porters and stouts, and bocks. New Glarus has released their Edel Pils, but that's it for them until July when they release the Dancing Man Wheat. We will review the Edel Pils soon. But not today. The Capital Fest, a summery light festbier will be out soon, if it's not out already; but Capital seems more interested in ratcheting up the hype (and distribution) for the Island Wheat. Leinie's has their Summer Shandy out, but it seems like they've kind of jumped the shark on that one and we may not get around to reviewing it; although, you never know, we just might throw it in a blind tasting sometime this summer for kicks. To my knowledge, the Tyranena Fargo Brothers Hefeweizen is not yet available. And so on. Like I said, late May is kind of a down time for beer releases. The bocks are done, the hefeweizens have not yet made their arrival. Although, like all of those May flowers planted in a ritalin-fueled frenzy last weekend, the hefes will soon appear and make our summers light, yeasty and subtly fruity (even without the ever-present lemon wedge that bartenders insist on shoving on the top of my glass). So, in anticipation of those Hefeweizens, we bring to you a hefeweizen that is available a few places around town, although this copy was procured at the West Side Steve's: the Kapuziner Bavarian Hefe, brewed by the Kulmbacher brewing group. Weighing in at a mere 5.4% ABV it is the ultimate summer beer. The website proclaims: "... tangy, fruity, with a typical, highly-fermented note. Naturally cloudy. Out of the beer cellar." Beer Advocate has only one review for this beer, while the folks at RateBeer seemed to have found it on a shelf. Summary: the surprising tartness of this beer makes adding a lemon-wedge completely superfluous; taken on its own it's an interesting take on the hefeweizen style, foregoing the banana and cloves for an apple-like tartness; after a long day outside, or sitting out on a patio on hot summer day this beer could really hit the spot. So, if you're in the brewing or distribution industry, raise your hand. OK, you can put them down. If you're an afficianado, raise your hand. OK, thanks, you can put them down, now. If you've randomly stumbled across this site and will be leaving soon, raise your hand. Oh, already left. Right. Well, not that it matters, I can't see you anyway. I was just trying to gauge whether anyone actually cares about this whole InBev-AB thing. If you're wondering who "InBev" are and what "AB" is, you can find out here and here, respectively. Needless to say, this aggregation would create the largest brewing entity in the world and the fifth largest consumer products company in the world. The news broke about this beast of a transaction early last week and I've put off commenting about it for now. But, now it appears that SABMiller is getting in on the action. While Bud is mulling its options, Miller has said they would welcome a "partnership" with InBev [cite, via the omnipresent Brew Blog], and InBev appears to be taking this seriously. It appears that this SAB-InBev move may just be a play to force A-B's hand; surely such a merger would be dark days indeed for Bud. Or at least on an international stage. And, that's an interesting dilemma for Budweiser; by foregoing this merger, Anheuser-Busch would basically be saying "Damn globalization. We are OK with the American market and we think anything more would dilute our brand. The rigors of being under InBev's bland-marketing thumb would sully our reputation. We have a reputation for quality product and quality service and we are unwilling to compromise that reputation for the prestige of a larger global identity. We are perfectly happy being the number one brewery for the number one country in the world, and we think that's good enough." Because the fact is everytime InBev takes over a brewery, they cut marketing budgets in that organization in favor of a centralized marketing system that emphasizes the niche that each brand can fill. I suspect Budweiser's niche would be the "hard working, beer as sustenance, male" niche. Which, granted, is filled all over the world, not just here in the U.S. It's funny because I'd never really thought much of Budweiser. I've never really liked Budweiser, and while I went through a brief "Bud Ice" phase, I've mostly been an MGD person for my swill of choice, though lately it's been PBR and/or High Life. But I was talking with an ex-tavern owner over the weekend, and he made an interesting comment. He told this story about a friend of his who had stopped managing his own tavern and took up with the Budweiser distributor. This friend would ride along when the distributor was dropping off the A-B products and would talk to the various tavern owners and managers. The guy would ask how things were going, whether the distributors were treating the tavern owners alright, whether the managers were happy with how the product was selling. Typical tavern chit-chat. And then, three times a year the tavern owner would get a survey from Budweiser asking many of the same things. If anybody marked any response with a "3" or lower (on a 5-point scale) Budweiser would call and ask why; they at least listened like they cared. I thought that was interesting. But what I found most interesting was this: A-B was the only one doing it; not Miller; not Coors; not Pabst. The tavern owner I was talking to said he sold primarily Bud for that very reason; he told the other brewers and distributors that if they would do that, he would be happy to sell, but that alone showed a dedication to customer satisfaction that none of the others seemed interested in pursuing. Of course, that's hearsay as far as all of you are concerned. But, it does make this point: Budweiser will no longer provide that kind of dedication to customer satisfaction if they are purchased by InBev - and that's a shame. But that's also a lesson to be learned for all of the craft breweries. It is a way to differentiate yourself. Customer service that the big guys are simply too big to provide. Go on ride-alongs with your distributors and talk with your retailers. Get out to the pubs and talk with the people drinking your beer. Get out to the grocery stores and thank your buyers for purchasing that six-pack. Support your community events. Many of the craft brewers I talk to here in Wisconsin are already doing this and that's why I think we have such a strong and vital brewing industry here. Not only is it a state that has an innate desire to drink local, but it's further ingrained by the breweries here being active in their communities and giving back as much as the communities give to them. The More You Know. Well, heck, this was kind of an old-school post - it got pretty far from where I thought it would go when I started writing it, but that's alright. This point is perfectly as good as the one I was going to make about the need for small breweries to band together in informal, or formal, organizations and pool resources to help each other where they can. For example, a buying group to buy in bigger bulk to get price discounts and reserved quantities for grains and hops that all of the members need to buy anyway. For example, an advertising group to place general advertising that benefits the group (e.g., "Milk it does a body good." or "Pork, the other white meat." or "Wisconsin craft beer, we aren't just Leinenkugel's anymore.") I'll write some other time about how I'm amazed that the craft breweries aren't doing this stuff. By the way, sorry for posting a day late - while I was able to get a post up on Monday, the holiday threw off my schedule. See you tomorrow, too! Ok. Last one, I promise. Anyway, I think you get the point. There are plenty of experts out there any of whom could have prevented the travesty that spurred this entire series. So, with all of that out of the system. One last day of beer and grilling recommendations for your BratFest Memorial Day weekend. First up, Randy Lee, brewmaster of Viking Brewery in Dallas, WI. A mere 3.5 hours from Madison, Dallas, Wisconsin (pop. 356), the home of Viking Brewery, is situated solidly in the North-Woods of Wisconsin, nestled between the Missippi River and Prairie Lake. Hot Chocolate makes excellent Chili, so it would probably make for some good BBQ. Nathan Berg up here at Native Bay does a pig marinated in Invader for that day that is reaaaaaaaaaaly good. I'd think Berserk would make a pretty good glaze also. While perhaps best known for their big, heavy ... well ... Viking-like beers, Mr. Lee's suggestions are all great for making your BBQ. A nice, sweet chocolate-y glaze for that pork roast; marinated meats in the malty and complex doppelbock; an intensely sweet barleywine to baste that chicken in. And you can wash it all down with a Queen Victoria's Secret or Dim Wit. Over on the East Side of Madison, the guys at Ale Asylum are fighting over ribs. For us, you can’t beat the dry rubbed ribs our assistant brewer Brian Schoop makes. He makes his dry rub with fresh ground spices and lets the ribs season in the fridge for at least a day. He’ll slap ‘em on the Weber in the back of the brewery and cook them so they meat doesn’t so much as fall off the bone as leap from it. Brian will challenge anybody who puts sauce on them to a knife fight. Meanwhile, we’re drinking Hopalicious and mocking him incessantly. The big hop flavor and citrus notes of the Hopalicious pair nicely with the rich smokey flavor of the ribs. The mocking keeps his head from exploding when us meatatarians start openly drooling. You can't go wrong with the Hopalicious, a supremely drinkable American pale ale. And, it makes me want to pull around back and sneak some ribs off of that grill. This is what summer is all about. According to Garrett Oliver, from his book "The Brewmasters Table", our East Side Dark is a beer with a deep reddish-brown color and a bready malt aroma adorned with rich chocolate notes. The bitterness is firm but balances very nicely against round, sweetish malts in a smooth, almost oily center. Soft chocolate and caramel lead into a long, dry, clean finish, with nuts and cocoa in the aftertaste. It's an excellent beer, and a real winner with grilled steaks, burgers, venison, Cajun blackened pork chops and Mexican mole dishes. I couldn't agree more with Garrett, that my favorite beer to drink while I grill, especially hearty meats, is our East Side Dark. My wife, who is Asian, likes to add spice to the grill menu. One of her favorite things to grill is chicken satay, which has an almost dry rub of curry flavors -- including coriander, cumin, white pepper, galangal ginger and lemongrass. It's accompanied with cold sliced cucumber and red onions and a peanut sauce dip that has many of the same spices. She's even made it with a healthy dash of our Cream City Pale Ale for the added hoppiness. The same beer, with its malty backbone, is therefore a good enhancement and balance for this grill item. Another favorite is grilled seafood such as skewered spicy shrimp with adobe sauce or mussels and lime leaves cooked with - more beer. In both instances, we've paired it with our Riverwest Stein that gives off a mellow, malty sweetness. You know, I'm beginning to regret having run this series, there is no room in my summer for improvisation - I have my entire summer planned food and beer-wise. Chicken-Curry Satay, sliced cucumber and red onions, steamed mussels, cajun-blackened pork chops. I hope you enjoyed this series of posts. All of the suggestions were fantastic and the enthusiasm of all of the participants comes through. If you're reading this from somewhere other than Wisconsin, hopefully it's inspired you to go out and grab some of your local brews that fit the bill. If you're reading from Wisconsin, well, you now have a summer menu. Post your own pairing recommendations in the comments and Happy Memorial Day. Thank you to all of the men and women who have fought and given their lives so that we can enjoy these summer weekends with our families on safe shores. Yesterday we talked with a couple of brewpub brewers. Today, we have just one guest, Lucy Saunders. She has, quite literally, written the book on grilling with beer. The book is called, unsurprisingly, "Grilling With Beer" and you can order it from her website. Her books not only suggested beers to be paired with your grilled food, but also recipes for including beer in your food. Ms. Saunders suggests that one of the best reasons to use beer in your BBQ sauce is because "beer is much less acidic than wine, vinegar or citrus juices commonly used in BBQ sauces and marinades. It will tenderize meats without breaking down texture as rapidly as more powerful acids." Moreover, "from apricot ale to witbier, there's a flavor that matches a meat, chicken or seafood sauce destined for the grill." My favorite style for grilled foods in spring is an unfiltered black wheat ale or dunkelweizen - it's a bit crisp on the palate, with some tart yeast notes and enough dark malt to meld with the seared and smoky flavors of most of my favorite grilled foods. The dunkelweizen is an interesting style. While it is a dark beer, it is not a heavy beer. In fact, dunkels can often be very light. But, it is not a particularly popular style. I'm not aware of any major Wisconsin brewery that makes one - though there is a rumor floatin' about that Tyranena might try an Imperial Black Weizen beer. And Das Bierhaus, an authentic German brewpub in Menomonie, makes one. So, here we are on Day 3. Yesterday, we talked to two retailers and they made some awesome suggestions. Before we get to today's guests, I want to add one more retailer response, Adam from Star Liquor. Here is where it is important to have and utterly quaffable brew because just like I might have a few of each sandwiches I will also have a few of each brews. A couple of favorites include New Glarus Edel Pils and Capital's Special Pilsner. In this case I tend to go for something with a bit of sweetness especially if the marinade is spicy. Lake Louie's Belgian Prairie Moon or Furthermore's Fatty Boombalatty fit the bill nicely. Here is where I cry out for more flavor and something with some good hop to it. Ale Asylum's Hopalicious and Central Waters Glacial Trail IPA both go down well with a hearty meal. I know this list is skewed to the local and I could have chosen any number of brews from around the country or the world but here at Star we try to push the local guy first and we are lucky enough here in Madison to be surrounded by some great ones. Awesome! Great recommendations focused on local supremely drinkable beer; what your beer snob friends might call "session" beers. Today's next guests represent not only the best brewpub in the Madison area, but an up-and-coming brewer opening a new brewpub here in Madison. Up first, brewer Mark "The Captain" Duchow is brewmaster at The Grumpy Troll out in Mount Horeb. Winner of numerous awards, his beers are at once highly skilled and refined, yet also completely approachable. As a brewmaster at a brewpub, he has years of experience crafting beers meant to be consumed not in isolation, but rather alongside the tastes and aromas of lunches and suppers. My favorite BBQ is Texas slow "Cold Smoked" brisket and hot smoked oysters. But I also dig Carolina style, vinegar based and slow smoked pork, and of course there is nothing like the Midwestern sweet tomato BBQ chicken. In Texas I drink a Lone Star with my Brisket and smoked oysters because of the fact that the only places you can get the best BBQ, they only sell Lone Star. I truly would love to pair up a true Texas BBQ with my Curly Peated Scotch Ale or the Spetsnaz Stout. But on the other hand on a hot Texas afternoon temps can reach 110 , a Lone Star is all I can handle. The Carolina BBQ is pulled smoked pork in a semi sweet soupy vinegar sauce served with boiled potatoes and cornbread. I would pair up the Flanders Ned Ale, Ned is a traditional Flanders-style red ale fermented with both bacteria and yeast. It is fruity and tart, a must try. I can see myself sitting in Fowler Park on a warm summer afternoon in my home town of Oconomowoc cooking over the grill with chicken drumstick smothered in sweet BBQ sauce and a Captain Fred in my hand. The Capt. Fred is an American lager and it goes great with the BBQ chicken tradition. The Flanders Ned is a great suggestion and there are plenty of other great Flanders' sour beers. The style is typically lighter, yet full flavored and with a great, unique sour, as opposed to hoppy bitter, bite. Our final guest for today is Joe Walts, ex-assistant brewer at JT Whitneys and now in the process of starting up a brewpub, RePublic, to be plopped smack into the middle of the boho East side. You can check out his blog, and follow his progress at http://republicbrewpub.blogspot.com - it's a great lesson in starting up a new small business, with problems that are not just unique to breweries. -Season the beef with Lawry's, which also does good things for Boca burgers. -Cook the meat medium-rare on a charcoal grill. -Sautee white onions in butter and Worcestershire sauce until crispy. -Butter the insides of the buns and brown them like grilled cheese sandwiches. -Top the burger with swiss cheese, burnt onions and mayo. If there's no kitchen nearby, raw onions and grill-charred buns are admirable substitutes. Mmm... BBQ. Joe wins mad props for the Burning River; as a native Clevelander, I've consumed more of this beer than I'm capable of remembering. But, what I also love about Joe's recommendations is the implicit acknowledgement and recognition that Bruce Springsteen related when asked about the meaning behind his lyrics. When asked whether he sat down to write these epic tales of working class life, The Boss replied that he was just writing what came, it wasn't until afterwards, and often not until someone else pointed it out, that he recognized the universal struggles evident. Similarly, despite the romantic notions perpetuated by beer snobs, and so-called experts, and the brewing industry itself - perhaps taking a page from the wine industry hype-book - the brewers are just trying to get the best beer out that they know how to make. It's not until some genius sits down with 30 family members at a picnic table and tips back an ice-cold Spetznaz Stout in the seering August heat while devouring cold-smoked brisket and says "You know, I would have never guessed it, but the chocolate and coffee notes and the full body of this stout are perfect with this bbq" that the world knows of this genius pairing. An unusual week to be sure. Not only are we focusing on a single topic, grilling and beer, but we're even publishing on Tuesdays!? Scandalaous, I know. Today, we start with the experts. In my meanderings about the fine city of Madison, I've come across a few retailers who really seem to know their beer. Not only Vanessa at Maduro, Matt and Josef at Brasserie V, and Adam at Star Liquor, but also Jan at the West-side Steve's Liquors and David at Barriques in Fitchburg (at PD and Seminole). I could talk beer all day with any of them. They know their stuff, are passionate, and quick with excellent recommendations. While Woodman's gets credit for quantity, each of these get mucho credit for quality - and, perhaps more surprisingly, for the most part their own preferences and tastes are reflected in their selections. You will find a number of beers at each of these locations that you won't find at the others. Of course, that means you have to make regular trips to each to see what's new ... but ... whoa be to anyone for whom this is truly a problem. So, when posed the question, "What's your perfect chilling with the fam grilling and beer combination?" This is what a couple of them had to say. Garlic, olive oil and rosemary marinated pork tenderloin with Maredsous Triple. (Belgian) The slight sweetness of the Triple marries beautifully with the garlic and richness of the pork. Sesame seared tuna steaks and Ommegang's Hennepin [ed note: Hennepin is a saison style]. Fast and fabulous! Spicy, thai-style shrimp skewers and Bells' Sparkling or Furthermore's Fatty Boombalatty. I love that recommendation for Bell's Sparkling, an underrated, interesting take on an American-ized and highly carbonated Belgian triple. And yes, PBR goes with everything. By the way, thank you to the most excellent Elvis Santana for the fine photo. Back on May 7, we had an article dissecting a poorly written article about the "Best Brews for BBQ ... wines, too!" It was an atrocious article that purported to question experts about the best beers to drink with your summer bbq. We complained at the time that not only were the "experts" very poorly informed, but their recommendations (a nut brown ale and a smoked porter) were downright bad. So, we promised that this week, the week before Memorial Day, we would run a series of articles that actually attempt to make some legitimate recommendations. We have some great guests this week, so stay tuned! For today, I wanted to get some of my own recommendations out of the way. My favorite part of grilling is the sheer simplicity of it. 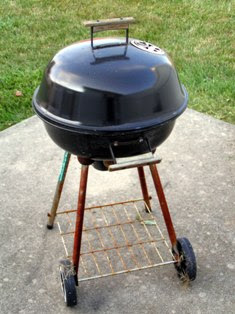 Burgers, hotdogs, and steaks just taste better on a charcoal grill than out of an electric oven, or stove top. And it's not just that earthy, sweet, smoky flavor that the grill imparts; but, it's the experience. Slowing down the day and kibitzing with the family and neighbors while the grill heats up. Cracking open a cold, crisp beer and having a few laughs in the midst of fresh summer breezes bringing the aroma of fire and meat and vegetables. Needless to say, a smoked porter is not particularly well suited for this task. For sipping while chilling try beers that are light and crisp, such as the New Glarus Edel Pils, the Ale Asylum Gold Digger, and the Lakefront Cream City Pale Ale. Of course, your intrepid journalographer, ummm ... me, prefers a bit of sweet caramel with that cold crispness, so I generally reach for the amber ales and lagers such as Ale Asylum's Ambergeddon, Leinie's Red, and Point Amber. At the end of the night, when I'm sitting by the bonfire, stick in hand and marmallow fingers, the beers of choice are nice and hoppy pale ales like Central Waters' Lac Du Bay IPA, Tyranena's Bitter Woman, and Capital's US Pale Ale. So, there's just a few ideas. I know, it's no ode to impeccable genius of pairing grilled meats with the perfect beer. But, trust me, our experts that will be here the rest of the week have some awesome, awesome ideas. The awesome folks over at the New York Times' Freakonomics blog, have an interesting post about economics and beer. The post is titled "The Rich Drink Better Beer, Not More." The basic gist of the post is that we only have so much time and capability to drink. Thus, while people double their spending as their income doubles ("income elasticity"), it isn't really reasonable to double the quantity of things that they buy. Thus, quality of purchases increases at a faster pace than quantity. Or, as Daniel Hamermesh puts it: "as our incomes rise, we increase the quality of what we consume." Thus, Mr. Hamermesh concludes, that if we live in an area where income is generally increasing, we should bet more on quality winning out than quantity. We've talked about this before. There we noted that Rep. Theresa Berceau's plan to raise the beer tax. In that plan she notes that "beer consumption is approximately evenly split across upper and lower income levels." But, we see, this isn't really true. Upper and lower income levels spend approximately the same amount, but don't really drink the same amount. Thus, a tax focused on the number of barrels of sold, taxes quantity, not quality. And thus the poorer are more heavily taxed than the (comparatively) richer. Think about it this way: at a bar in town I can buy a glass of New Glarus' Belgian Red for $6, or I can buy a pint of Miller Lite for $2 - but both kegs are taxed the same ($2) for that keg. So, If I spend $6 at the bar, I have either paid the tax once, or I've paid it 3 times. Chances are if I'm "a person of lesser means" I probably bought the 3 Miller Lites. (We'll ignore for the moment the fact that I probably could have purchased a higher-alcohol beer for the $6 and gotten pretty close to the same amount of alcohol but had it taste much, much better). But, beyond the tax issue, what this also means is that there is plenty of room on the upper end of the price range for beers. In my meanderings I've seen one Wisconsin brewery price its single bottles above $10 - Sprecher had its anniversary beers, packed in 750ml bottles, priced at $15. Lake Louie had 6 packs of its Louie's Reserve priced at $12.99 and I think a few others have priced 6 packs over $10. I think Central Waters' 22oz bottle of its Coffee Stout approached $10. Not even the Belgian Red and Raspberry Tart are over $10. I understand that there is a "mental purchasing barrier" at the $10 limit. That's "a lot" to spend for "just" a bottle of beer. But, we don't think twice about dropping $15-30 for wines. Personally, I think part of the mental triggering mechanism is the fact that beer is anchored to the cooler. If it were pulled out and put, lovingly, on shelves - like how wine is displayed - with adequate education (either from store help or from shelf talkers and explanatory pamphlets), I think people would spend the money. Usually with "Hey Barkeep!" we try to answer one question in detail. This month we're going to take a few questions – some from real live folks, but some from the searches that end people on this site. As I'm sure you are aware, I have the ability to see how many people visit this site each day (for those interested, it's around 100 per day, plus another 100 from RSS feeds). About one-third to forty percent of those visits are from search engines. Did you know that I can also see what people searched for that resulted in them being at my site? It's great fun. But first. Trust me we will do a much bigger piece on this closer to Memorial Day, but on Wednesday we were talking about beers for grilling and BBQs. So, what would I recommend for drinking with grilled chicken? On the first day that the ol' MBR grill got busted out for the year, we had grilled chicken marinated in tandoori and garam masala spices and a lemon artichoke salad (with some carrots and potatoes thrown in for good measure). Paired with this wonderful food, we had the De Proefbrouwerij Saison Imperiale, a Special Reserve Belgian Farmhouse Ale from the Brewmaster's Collection. It was purchased for $9.99 + tax (about $10.25 or so) at Steve's on the west side. Also under consideration for this meal was the Thiriez Blonde ($12.99 plus tax). The Imperial Saison (nomenclature aside) complimented the chicken well. While I would have preferred a bit more hops (maybe the Blonde would have been better), the pleasant fruity tartness cleaned the palate well and the additional body on a traditionally lighter-bodied beer didn't make me full. The musty, cherry and lemon aromas complimented the chicken's earthy spices and the salad's acidity. All-in-all, a good choice. Q: "Steam beer is classified as which general beer style"
A: Back in January we talked about a taxonomy of beer. We talked about how the "family" of beer has two "genus" types – ales (top fermenting yeast) and lagers (bottom fermenting yeast). Steam beers use lager yeast, so they are technically, lagers. We then discussed how you can group the genus of ale or lager into two species: warm fermenting and cold fermenting. And in each genus you will have beers of each species. Most ales are warm fermented (temperatures above 55 degrees F), but porters are cold fermented ales. Similarly, most lagers are cold fermented (temperatures below 45 degrees F), but steam beers are warm fermented. So, to answer the question: steam beer is a warm-fermented lager. Q: "Average amount of alcohol compunction"
A: Compunction: a feeling of deep regret. Despite my guess that the person meant "consumption" not "compunction" I would guess that the average amount of feeling of deep regret related to alcohol is fairly high and directly proportional to "consumption" on a rising logarithmic scale. Q: "Drank too much and vomited"
A: Yeah. That'll happen. Probably a great amount compunction (see above). Q: "Alcohol spending in Wisconsin"
A: For the most recent data I could find online (Fiscal Year 2002), the state of Wisconsin collected $9.6 million in excise taxes on beer. At $2 per barrel (although there are some breweries that only pay $1 per barrel), that's more than 4.8 million barrels (31 gallons) of beer. Given that Wisconsin only has 5.6 million people, 24% of whom are under 18, that's over a keg of beer per adult in 2002. To get a rough idea of the amount that we spend on beer, we can multiply the number of barrels sold by the going-rate for a keg (31 gallons, also called a "half-barrel", but one of these days we'll get into this weird naming system). Ranging from $45 (Natural Light) to $150 (Guinness), we can take a weighted average and call it, maybe $80? Would you agree that that's fair? So $80 a keg for 4.8 million kegs is $384 million or thereabouts. A third of a billion dollars on beer alone in the state of Wisconsin. Nice. Q: "What is rauch ale"
A: Rauch beers are smoked beers. They can be either ales or lagers. In either case, the malts are smoked before use, traditionally over beech-wood, in some cases hickory or apple woods. For the smoking process, the malted barley is confined with smoking wood for a period of time (as little as a few hours, as much as a day or two) then used in an otherwise normal brewing process. I haven't heard of breweries "cheating" and using "liquid smoke", but I'm sure it happens. Q: "Returnable beer bottle Indiana"
A: Don't know. Why don't you ask the Hoosier Beer Geeks? Are you excited? 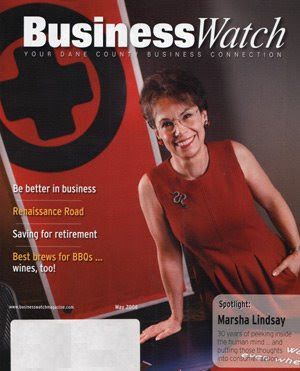 The latest Dane County BusinessWatch magazine is out! I know, as a beer geek you've been waiting all year for this issue. It's the issue where this bastion of fine business journalism looks at the "Best brews for BBQs. ... wines, too!" Don't forget the wines. 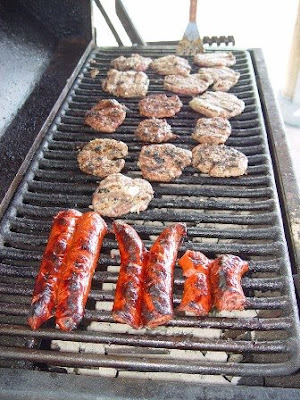 Summertime, and the grilling is easy. Brats are jumping, and the temperature’s high. But what wines and beers go best with grilled meats? The answer often depends on what you’re preparing and for whom. Wait a minute, now it's "wine and beer." What happened to "best beers" (and wines, too)? But still, the brats are jumping and the temperature's high. Perfect for an ice cold Capital US Pale Ale? A New Glarus Edel Pils? A Tyranena Three Beaches Honey Blonde? Heck, maybe a Furthermore Proper, a Central Waters IPA, or any of the dozens and dozens of Wisconsin summertime beers. Grilled meats — burgers, brats, tuna steaks, hot dogs and ribs — appear either naked on the grill or dressed in tangy, sticky barbecue sauce that can alter the entrée’s flavor palette, dictating which beverages best match it. Sometimes it’s best to check with the experts before popping the wrong cork or twisting an incorrect cap. Well, it's not always best to check with an expert first, but I understand what you're getting at. I thought this was about beer (and wine, too)? This is starting to sound like it's more about wine. 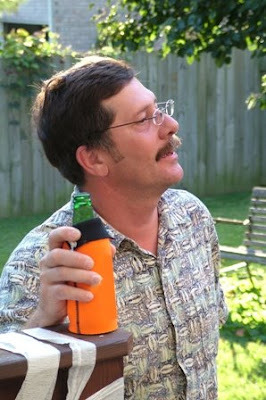 Moreover, it doesn't look like this "expert" would know a good, Wisconsin beer if it came gift wrapped. There's only three Wisconsin beers on the Delmonico's "Wine List" - Fauerbach Amber, Capital Amber, and Miller Mother-f'ing Lite. Now, I'm not slamming Fauerbach or Capital, they make fine beer, but, come on - Capital Amber?! This is a beer list chosen by a distributor, not by someone who knows anything about beer. I'm sure Mr. Madigan knows everything there is to know about wine, and admittedly, that's what he's talking about here, but I thought this was an article about "Best brews for BBQ ... and wines, too"? • Roshambo Zinfandel (about $14), from California’s Sonoma Valley, is not your typical fullbodied “peppery” Zin. Characterized by jammy fruit flavors, the wine is brighter than other zins and easier on the palate and the pocketbook. • Qupé Vineyards Syrah ($19) is a richer, fuller wine, but one with good fruit, serving as a fine match for grilled fare. • For something completely different, go with a Furst Gewürztraminer ($12). Gewurz is German for “spicy,” and the white wine, produced in France’s Alsace region, is redolent of fresh apricots and spice, delivering flavors both refreshing and unique to the average American wine palate. Setting aside the derogatory "average American wine palate" we have now had descriptions of three wines and not a single beer even mentioned. Oh, here we go. The article about beer and we finally get the "if you plan on serving beer" like "not that you'd want to, but if you're going to ..."
suggests Samuel Smith Nut Brown Ale. Lighter in body, but with a nice caramel malt flavor, the British brew stands up to anything your picnic table can support without weighing the drinker down. For a high temperature summer barbecue you recommend a nut brown?! Not to say you're not entitled to your opinion, but this suggestion is absurd from a professional. Besides the obvious fact that it's one of the few beers that he actually serves, who the heck orders a Samuel Smith Nut Brown in the middle of August to drink with burgers and ribs? If you're saying to yourself "nobody," you'd be pretty darn close. No Tyranena Bitter Woman, Lakefront Cream City, Lake Louie Premium. No. Screw all of those. You want a Samuel Smith Nut Brown. Does Mr. Madigan get a commission on the stuff? ummm ... I thought this was about beer (and wines too)? Why are we still talking to sommeliers? You couldn't find a single person knowledgeable about beer to help you? The score is now 3 wines to 1 beer. Let's see, maybe Mr. Foley knows something about beer, at least the Capitol Chophouse sells Ale Asylum. the Italian red wine, made from the Sangiovese grape, helps tame the sauce’s character and stands up to its more strident elements. • Lighter sauces demand brighter wines, such as Campo Viejo Riserva ($15), a Spanish red made from the Tempranillo grape with a buoyancy that pairs an inherent earthiness with hints of wild strawberry. • A mixed-meat grill – burgers, brats and chicken breasts are popular– calls for a more well-rounded wine, such as the Zilzie Shiraz ($12) from Australia’s Victoria region. The lighter body and brighter fruit make the wine a hit with more drinkers. That's three more wines and so far, only one poorly suggested beer. This is absurd. Why was "beer" even in the title to this article? If you can't do something right, don't do it at all. Clearly, these guys know a lot about wine. The descriptions are interesting, and seem appropriate for the food. But so far, the beer knowledge is, excuse the phrase, piss poor. while on the beer side he suggests extending that palate with a German rauch (smoked) beer. Rauch beers with smoked food is widely considered obvious and a big no-no amongst the beer-food-pairing cognoscenti. The double smoked whammy is usually just too much - save the smoked beers for creamy, but firm cheeses like gouda and strong, rustic, non-smoked, foods where the smokiness adds flavor to the meal instead of compounding the flavors. So, Mr. Foley doesn't seem to be of any more help than Mr. Madigan. Dan Carey, brewmaster for New Glarus Brewing Co., created his own version with Smoke on the Porter, part of his “Unplugged” series that mixes rauch beer elements within the body of a dark British porter. “I like Smoke on the Porter because the smoke element is more mellow and understated,” Foley says. Besides the fact that this was New Glarus' winter seasonal beer and will likely be off the shelves by the time the summer grilling season rolls around, who would drink a full-bodied smoked porter in late July? Sorry, but this article does absolutely nothing to educate consumers on beer choices for summer barbecues. It covered seven wines, and two beers that best consumed in the fall! And it was billed as a beer article, remember? 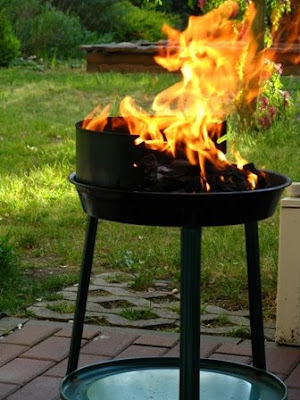 "Best brews for BBQ's ... wines, too!" But it was actually, "Best wines for BBQ and a couple of beers that you will really like in late October." In the coming weeks, I promise you we will post some actually usefully information about beers that you might actually enjoy with that bbq. In the meantime, please, please do not take the advice of these sommeliers. Who knew there was such a thing as "premium" light beer? Or, more precisely, who knew that Miller Lite is considered a "premium" anything?! But, it's still an interesting question. Given the economic downturn, and beer's status (particularly craft beer's) as a luxury item, will people start turning to beers like Busch Light, Old Milwaukee and Milwaukee's Best instead of drinking Dogfish Head 120 by the case? According to Miller Brewing's henchman over at Ye Olde Brew Blog, "wide price gaps can encourage people to trade down." Currently, the going price for a six of New Glarus Seasonal seems to be around $7.99; a case of the stuff will set you back a cool $32. Compare that with $17.49 for a 30-pack of Busch Light. A price gap of $14.50. The price gap between Miller Lite, a "premium light beer," and Busch Light, presumably not a "premium light beer," is $4.33, up from only $3.94 a year ago; and Miller is worried about defectors. So, is a widening a price gap going to make you change your beer drinking habits? If not, what price reducing tactics, if any, do you intend to take? Here at MBR we're hoping to get more free beer. The problem is – it's not available. But what I really didn't know was that I was stepping into a decade long hornet's nest (mixed metaphors? Me? Never!). So, what do you think of these "Alcohol Facts"? As a consumer, it doesn't seem to me that there is anything too objectionable. Well. Besides that "definition" of "moderate drinking" (currently defined as "one drink per day for women and two drinks per day for men). Yet, various groups have various objections. For instance, the Beer Institute, the primary beer industry trade group, objects to publishing alcohol content. This group would prefer to keep this information from you because "The alcohol content in most beers is in a very narrow range, and consumers are generally aware of that fact." Like the Beer Activist, I call shenanigans on that one. Beers can range from less than 4% ABV to over 20% ABV, while maybe a 16% range is "narrow" to some, it seems like a pretty broad range to me. Why does the beer industry promote this theory? Well, "The fact is that distilled spirits can contain up to ten times as much alcohol per ounce as a can or bottle of beer. A whiskey drinker can consume as much alcohol in one swallow as a beer drinker consumes in one beer. Most cocktails that Americans will recognize contain more alcohol than a bottle of beer; many contain twice as much. … The misguided equivalence campaign favors an industry that imports most of its product and contributes disproportionately fewer jobs and tax dollars to the U.S. economy when compared to the beer industry." In plain English? The general theory for taxing alcohol is for the industry to help pay for some of the damage that it causes (e.g., increased hospitalization, drunk driving, etc.) – and the beer industry's stance is that by taxing by volume rather than total alcohol output the beer industry is disproportionately taxed for its relative contribution to public drunkenness. For example, in twelve ounces, you can have 4% ABV of beer, or you can have about a third of a bottle of tequila at 40% ABV. What the left hand doesn't want you to remember is that your average drinker drinks more beer than liquor. Moreover, some of these Beer Institute members are talking out of both sides of their mouth, as Anheuser-Busch, MillerSAB, and InBev (the world's largest beer distributors) are aggressively adding to their liquor holdings as well. This issue also affects what an appropriate serving size is. I would argue that an appropriate serving vessel for the Dogfish Head 120 IPA, a 21% ABV beer, is a champagne flute. In that case a single twelve ounce bottle is two servings, not one. To get the same alcohol content of one twelve ounce bottle of the 120 IPA, you could drink almost a whole six pack of Miller Lite (which one looks like the better deal now?) This all means that the "typical" nutrition information is effectively cut in half – making beer look almost downright healthy! Then, in 2005, the TTB finally published a proposed rule, setting out the standards for putting labels on bottles of alcohol. There was significant disagreement among the commenters at this time about whether the labels should be mandatory or optional. The medical associations, CSPI and distillers all favored mandatory labeling. The brewing industry preferred that labeling remain optional; ostensibly because the labels would increase costs. There was also disagreement whether to list alcohol content by percent (as is traditional) or by actual volume (about .6 fluid ounces per 12 ounces of "regular" beer, 5 ounces of wine and 1.5 ounces of 80 proof liquor). Recognizing the wide range of alcohol content of beer, the US Bureau of Consumer Protection noted that "Beers in the marketplace range from approximately 3.3% to 17% ABV, thus delivering between .39 and 2 ounces of alcohol per [12 ounce] serving." Perhaps thinking that consumers may be interested to see exactly how little alcohol is in a 12 ounce "regular" beer (only .6 of an ounce? That's not much is it? ), the CSPI withdrew their request to display alcohol content by actual volume. The breweries were also in favor of a percentage approach mainly because "a standard serving size is not consistent with the manner in which many alcohol beverages are actually consumed." During the course of the 2005 process, the comments clearly indicated that "consumers are very interested in having information about the calorie and nutrient content of the alcohol beverage products they purchase. These consumers expressed the view that this information should be available on the product's label." The latest proposal, issued in July of 2007, merely amends the 2005 proposal to solidify the requirements around the concerns raised to the 2005 proposal – comments for this 2007 proposal ended at the end of January 2008. This proposal would require a "Serving Facts" label that displays alcohol content by volume (disclosure of ounces of alcohol would be voluntary), the serving size (defined as the amount of the alcohol beverage customarily consumed as a single serving – for beer less than 10% ABV, 1 serving is 12 ounces, over 10% ABV, 1 serving is 5 ounces), calories in the serving, carbohydrates, fat, and protein. This proposal would have a delayed effective date to allow a three year implementation period so that small businesses could use up existing label stock and get new labels produced that conform with the requirements. While the government deleted a comment from "J. Citizen", as a "J. Citizen" myself, maybe I can use my own forum to comment. Really, more information can't be a bad thing. Unfortunately, so many companies use these labels for misleading purposes (e.g., by using unrealistically small serving sizes, etc.). But, as Starbucks is finding in New York City where all chain restaurants are now required to display calorie, carb and fat information at the point of retail sale, more information doesn't necessarily equate to lower sales. People just want to be informed of what they are putting in their bodies. Moreover, the definition of serving size promulgated by the TTB seems eminently reasonable. While quite a few people will drink an entire bottle of, say, the Dogfish Head 120 IPA at 21% ABV by themselves, it doesn't seem absurd to recognize this as, at least, two servings. Interestingly, the craft beer industry suggests (pdf) even more specific serving sizes: 12 ounces for less than 10%, 6 ounces for 10-20%, and a mere 2 ounce serving size for beers over 20% ABV – a shot of 120 IPA anyone? While I applaud the effort, I think that this breakdown unduly "rewards" high alcohol beers (basically divides calorie and carb information in six!) and is not particularly realistic (to wit: the aforementioned champagne flute of 120 IPA).Where the government gets it wrong, I think, is not requiring full ingredient information. There is some suggestion that this is intentional so that people don't realize just how unprocessed some beers are as compared to others. But again, if we view this as a consumer protection regulation, don't you want to know that the beer you are drinking contains more corn than barley? Or more "lemon flavoring" (and the components of that "flavoring") than actual lemons. I recognize the "hassle" of re-tooling bottling lines, or more specifically the labeling portion of the bottling lines, to accommodate this regulation. However, the phase-in period seems reasonable and, really, how much of a hassle can it be? I don't see how it requires anything more than moving some text around on the label to accommodate the "Serving Facts" and printing the label. Perhaps the bigger hassle is actually learning how to calculate this information? Indeed the Brewers Association suggests that reporting tolerances be expanded so that small breweries without the labs of the bigger breweries don't "accidentally" violate the regulation. Recognizing the inevitability of this regulation, the brewing industry also finally recommends that they be allowed to use as small of a label as possible, preferably a linear display over a full "serving facts" panel.